Story: Lt. Col. Jacob Revere was a super-spook operative for the US army special forces. He went missing during a covert mission against the Iraqis during Desert Storm in '91 and resurfaced as leader of R.A.G.E. in 1997 . Revere was only leader a short time after X-O Manowar came into existence. 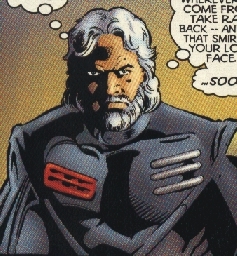 Citadel, the leader of Hard Corps, was interested in getting his hands on the X-O armor and formed and alliance with R.A.G.E. . Revere was killed by Citadel when he tried to stop Citadel from taking over the control of R.A.G.E. .